What do states want, deep down inside? What to they yearn for in the dead of night? 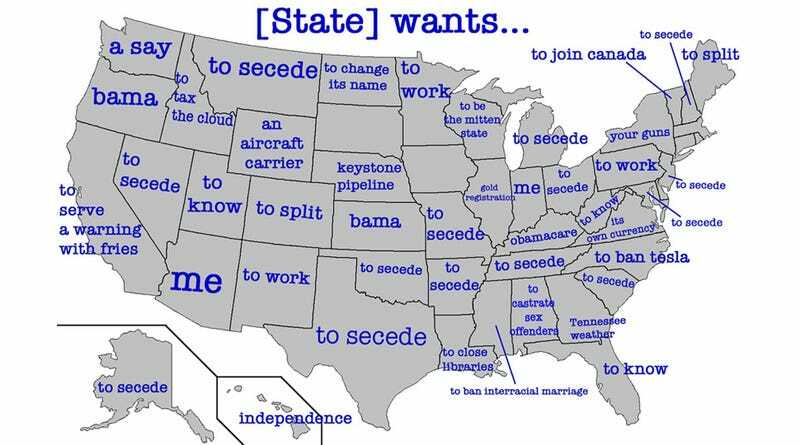 According to this delightful map from Mashable—with a little help from Google autocomplete—the answer is mostly secession. But also some pretty freaky stuff! A whopping 11 states—including Maryland?—would like to break off from the Union, while Hawaii wants full-on independence, which is what you call it when you are still mad about being annexed instead of just being bored in your civic relationship. But what state doesn't dream of freedom? Much better to dive into the outliers and weirdos. And there are plenty of each. There are a few irregularities here worth noting as well; both Oregon and Kansas want Bama (in football? maybe? but why Kansas? ), while Iowa, South Dakota, and a swath of New England apparently want for nothing. It's also important to note that this is the sum total of what everyone is Googling about these states, so there is plenty of stereotyping at work.